PKEE presented the “Contribution of the Polish energy sector to the implementation of global climate policy” report at the COP24. 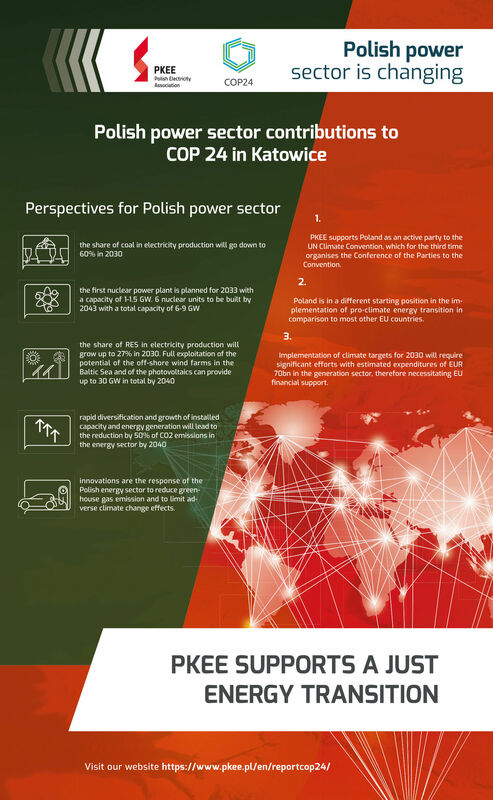 On December, 6 during Power Sector Day at the COP24, the Polish Electricity Association presented the results of the report on the contribution of the Polish energy sector to the implementation of the global climate policy. The presentation was co-hosted by Grzegorz Tobiszowski, Secretary of State at the Ministry of Energy. The event was attended by representatives of, among others, the European Commission, and the Polish and international power sectors. PKEE’s report presents the contribution of the Polish electric power industry to the implementation of the global climate policy. One of its main conclusions points out that despite unfavourable circumstances, including the historical dominance of coal-based technologies, the electric power sector is effectively taking measures aimed at the reduction of CO2 emissions. The biggest contribution to the reduction of carbon dioxide emissions in Poland since 1990 has been made by the power sector. The high, ca. 98% share of coal in the baseline electricity generation mix in 1990 has dropped to about 77% – said in his comments to the results of the report Grzegorz Tobiszowski, Secretary of State at the Ministry of Energy. In recent years Poland has reduced the energy intensity of its economy by 30%, reduced the greenhouse gas emissions by 30%, and also significantly reduced the levels of SOx, NOx and particulates – added Minister Tobiszowski. Commenting on the results of the report, the representative of the European Commission, Yvon Slingenberg, Director DG Clima, stressed that the energy transition must be an evolution to be a just process. In the opinion of the expert commentators of PKEE’s report, the fight against climate change should be a global and joint effort with the full commitment of all the parties. Only then it will be able to bring real results. The “Contribution of the Polish energy sector to the implementation of global climate policy” report was developed by the PKEE in collaboration with Ernst & Young Business Advisory. Click here to see an extract of the report.